After diligently studying the weather forecast for weeks, the stars literally aligned for this shot. Getting a clear night, no snow on the ice, no moon and no other photographers was a golden opportunity, so I seized the day (or night) and worked the scene like a man on a mission. Using just a headlamp I was able to light the 2ft deep cracks in the ice from multiple angles to highlight the hypnotic, prismatic quality of those intricate shapes. I combined two exposures. One for the sky and mountains and then another for the cracked ice in the foreground. If you’d like to see exactly how I processed this shot and combined these two exposures I’ve created a Photoshop Video Tutorial for ‘Hairline Fracture’ where you can learn my shooting and processing techniques. I’ve also put together a collection of free astrophotography tutorials in my blog. 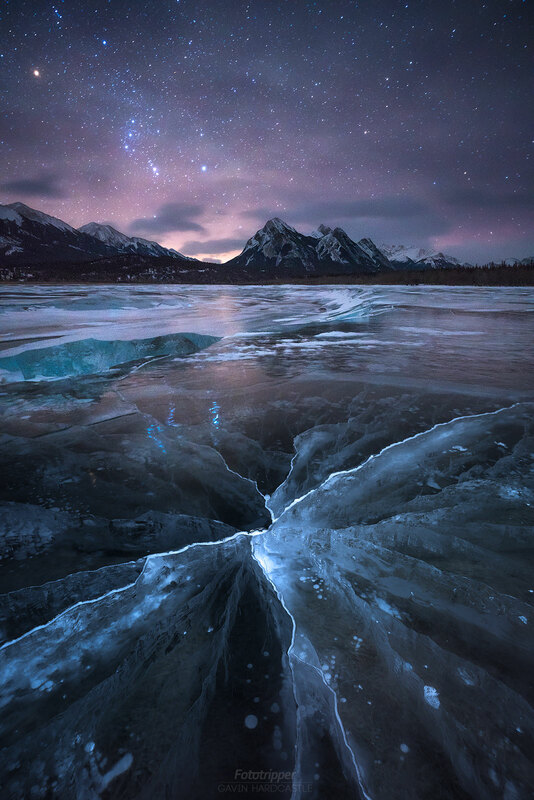 I can’t wait to go back to Abraham Lake to find new and fascinating ice artworks like this.